One problem I hear a lot when learning to hand letter is that there isn’t enough time! 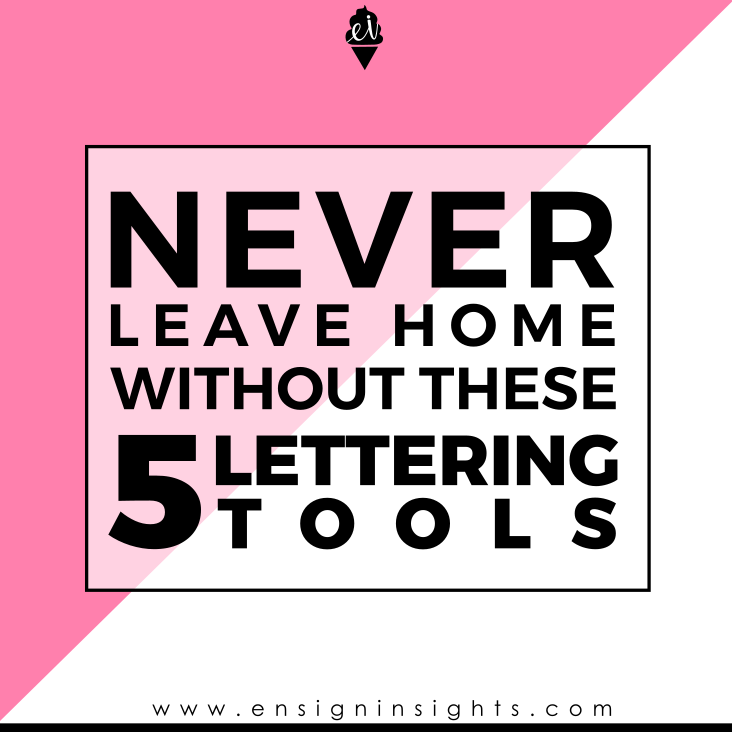 I can’t give you more time, but by never leaving the house without these 5 lettering tools you will be surprised how much easier it will be to find the time. If you would like my complete list of brush pens to start with, go here. A pencil. Absolutely essential. If you like mechanical pencils make sure you have plenty of led. If you like regular pencils, make sure you also have a mini sharpener. An eraser. I always use up the erasers on the end of my pencils so quickly so I just always carry an extra. I like these erasers because they erase with less pressure, they don’t shred the paper, and they don’t leave as many eraser shavings. Paper. I always have some kind of paper with me, even if it’s just a hotel pad or some scraps of copy paper. I got a small notebook at Walmart that I fill with quotes and ideas. It is my space to start sketching right when an idea comes. It’s nice to have a small notebook that can fit in your pencil pouch. A fine point pen. This is great for tracing over your design or doing some fauxligraphy. My favorite used to be a Pilot G2 pen. Some of my other favorites are Micron, Stabilo, or even the end of a Tombow Dual Brush pen. A small brush pen. I always have my Tombow Fudenosuke hard or soft nib (normally both). These are nice because since they are small, you can letter designs that fit in a small notebook. Practicing with a brush pen is different than with pencil and you never know when someone will need you to brush letter something for them. Take a pencil pouch with you wherever you go. Including while you’re at home. You may have a few spare minutes while dinner is cooking. 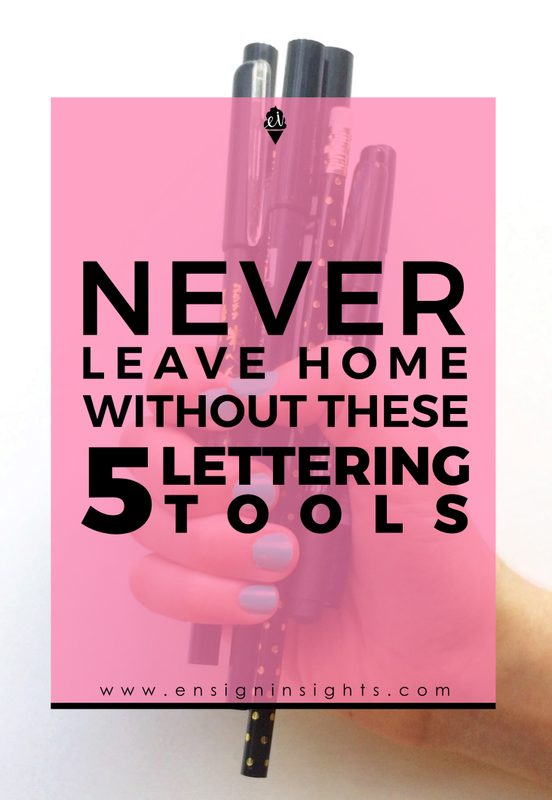 You can grab your pencil pouch and letter on the kitchen counter instead of pulling out all of your lettering tools at your desk. Letter in your car while waiting in traffic or waiting to pick someone up. Letter while you’re waiting for dinner in the oven. Letter while you’re waiting for an appointment. You don’t have to have time blocked out to letter. Just make a habit of doing it in the small moments. You can even letter on everything. As I make lists sometimes I find a fabulous “G” that I love. When do you find time to letter? Would you add any other tools to this list? Let me know in the comments!